The US has had a hit-or-miss relationship with tactical rocket launchers over the years. In WWII they used some towed systems and the famous “Calliope” system on the M4 Sherman tank but overall nothing like the Germans or Soviets. In Korea the USMC made extensive use of towed rocket launchers using helicopters in the “hit and git” system of fire support. But overall nothing much else. The Honest John and Little John were essentially nuclear delivery systems. But in the early 1980s the US Army began to field a new modular rocket system called the Multiple Launch Rocket System or MLRS (just to be different, as the rest of the world systems were usually called multiple rocket launchers or MRLs). It used two six-shot pods firing 227mm rockets to ranges of around 30 kilometers (it varied based on source) and was able to set up, fire, and leave in less than two minutes. The new Heavy Expanded Mobility Tactical Truck family (HEMTT) was introduced at the same time with the M985 as the dedicated reload vehicle with a HIAB type crane for handling. A self-propelled launcher/loader (SPLL or “Spill” to its friends) would pull up next to the M985 and find its packs already on the ground. Running out the expended ones and lowering them to the ground, the SPLL would then pick up and load the new packs and then move out in a matter of 15 minutes or less. The M985 would pick up the expended packs for return to have them reloaded (at depot or higher level unfortunately). But the original vehicles had a number of problems. After firing 108 rounds (nine full loads) the SPLL had to be sent to a depot for recalibration of its aiming equipment and systems. It also had problems with the fact it was optimized for war in Europe and had no air conditioning or other adaptations for the desert. It was also now capable of firing the ATACMS tactical guided missile with a 150 kilometer range, so after some interim changes the M270A1 was an upgraded vehicle introduced in 2005 with much improved fire control and the ability to use GPS guided rockets. Over 1,300 MLRS were built before production ended. 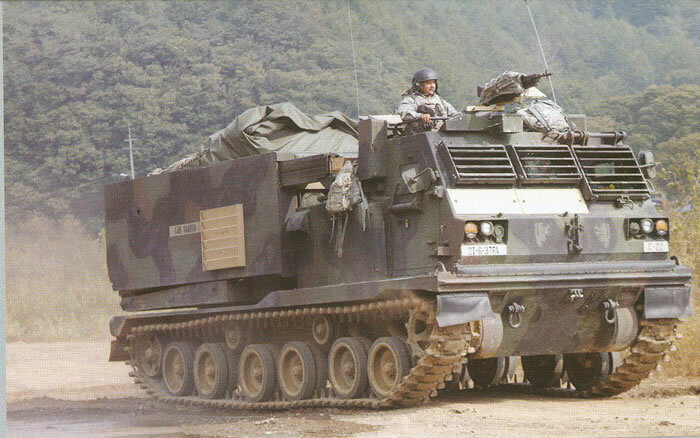 DML originally introduced a kit of the M270 MLRS and two offshoots, a NATO version and a dedicated Bundeswehr version, in the mid 1990s. They were very nicely done for the time with the only bugaboo a rocket pack that was finicky to assemble and some detail quirks. Now DML has essentially re-released that kit but with a set of the external upgrades for the SPLL and also the improved fire control equipment for the cab. The kit can be built (with some care and good resources) as either the M270 or the M270A1 as both sets of parts are in the box. The cab has a full interior and the blast louvers can be presented as open and elevated, opened, or closed. Seven of the first eight steps in the directions cover the construction of the cab interior. The suspension was well done for the time and still holds up well, and the “link-and-length” tracks, while one of the first from DML, still look the part. The launcher assembly is pretty straightforward and if care is used the rocket pods and their carrier frames may slide in and out of the launcher. Note that the problems with the original pods were that the frames were hard to get to fit together around the rocket tubes, so take care when assembling these parts. Step 24 covers all the next external parts, and one of those is a mount for an M240 7.62mm machine gun over the commander’s hatch. Two finishes are offered for the kit: C-22 “Car Ramrod”, 6-37 FA Battalion, 2nd US Infantry Division, ROK (black over forest green with regimental crests on the front of the SPLL); 4th Battery 52nd Artillery Battalion, Bundeswehr (black over green, Maltese crosses, Y-827 251). A small sheet of Cartograf decals is included and also provides the FS30277 sand patches for the codes and names on the 6-37 vehicle. Overall this was a pretty good kit the first time around and the addition of the necessary upgrade parts will help in making it a really nice model.